Long before Zika arrived in the Americas (in 2014), before Chikungunya jumped to the Caribbean (in 2013), and even before Dengue re-emerged after 70 years in Key West (in 2009), researchers have been warning us that the Americas and Europe are not safe from emerging or re-emerging mosquito disease threats. 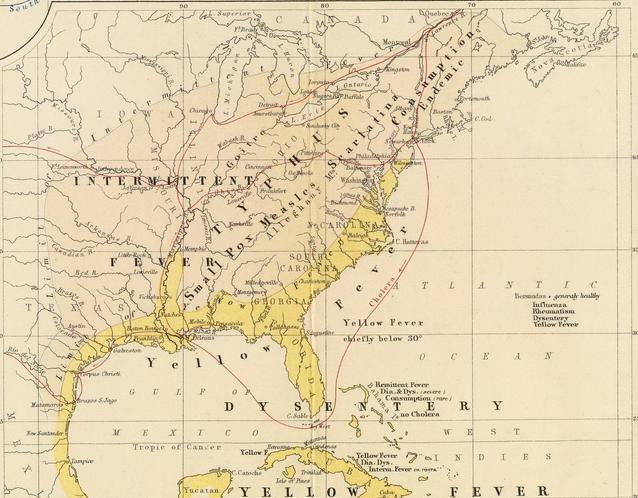 The maps below show that diseases like Malaria and Yellow Fever once plagued much of the settled United States (with epidemics as far north as Boston and Michigan), until comprehensive mosquito control efforts during the early part the 20th century successfully beat them back. The last major Yellow Fever outbreak in the United States was in New Orleans in 1905, but it wasn't until 1949 that the U.S. was declared free of malaria as a significant public health problem (cite). While there are societal factors (mosquito control, window screens, air conditioning, etc.) that will presumably help limit any outbreak's impact, we have both the climate and the right mosquito vectors to support a variety of mosquito borne illnesses, including Yellow Fever, Dengue, Malaria, Chikungunya and Zika. And we need look only to the arrival of West Nile Virus in 1999 - a mosquito-borne illness that prior to the mid-1990s was considered mostly mild, but which has since proved to cause significant neuroinvasive disease in a minority of cases (sound familiar?) - to see how quickly a new threat can spread. 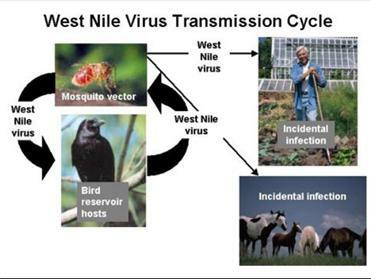 From West Nile Virus: An Historical Overview by James J. Sejvar, MD we get a description of an apparent change in virulence of WNV infection once it arrived in an urban environment. West Nile virus (WNV) has quickly established itself in North America since its recognition in New York City in 1999. Historically, WNV has been associated with temporally dispersed outbreaks of mild febrile illness. In recent years, the epidemiology and clinical features of the virus appear to have changed, with more frequent outbreaks associated with more severe illness being noted. The 2002 outbreak in North America was unprecedented in terms of the number of cases and geographic spread of the virus. Historical patterns of WNV provide few indications as to the future behavior of WNV in North America. Beginning around 1996, the epidemiology and clinical spectrum of WNV appeared to change. A large outbreak of WNV occurred in the area around Bucharest, Romania, and was notable for a number of reasons (14, 15). It was the first WNV outbreak to be centered in a predominantly urban area, and it was the first outbreak of the virus in which the preponderance of symptomatic cases involved CNS infection. Since WNV arrived in NYC, it has spread to all 50 states, and causes tens of thousands of mild West Nile Fever cases every year, and anywhere from a few hundred to several thousand cases of severe neuroinvasive West Nile Virus. In 2012, the CDC reported 2,873 severe neuroinvasive WNV cases and 286 deaths (see JAMA: The 2012 West Nile Encephalitis Epidemic in Dallas, Tx). 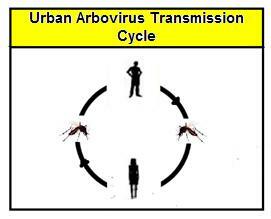 WNV has an advantage in that it has a sylvatic cycle (birds to mosquitoes). Human infection is basically a result of incidental collateral damage (see graphic below). Zika, Dengue, and Chikungunya - at least outside of Africa and Asia - have no known non-human animal reservoirs, which means they have a harder time becoming endemic. But when enough people become infected, these viruses are able to sustain themselves in an Urban Cycle, where transmission is strictly human-to-mosquito-to human. In the middle of the last decade we saw Chikungunya made a break from Africa, and jump to Reunion Island in the Indian Ocean where it reportedly infected about 1/3rd of that island’s population (266,000 case out of pop.770,000) in a matter of a few months, before moving on to Southeast Asia. About the same time, Dengue began to turn up again in the United States after decades of absence. In January of 2009, in Outnumbered By A Competent Vector, we looked at reports of Dengue's incursions into Texas and Queensland, Australia. In 2009, Dengue Resurfaced In Key West after a 70 year absence, but even months before that, we saw a cautionary report from the Natural Resources Defense Council (see NRDC Report: Climate Change and Health Threats) warning that Dengue and other vector borne diseases could one day reestablish themselves in the United States. Meanwhile, this growing threat of mosquito-borne illnesses wasn't going unnoticed in Europe, and in 2010 the ECDC's journal Eurosurveillance devoted a special edition to the threat to the EU from Vector-borne diseases - December 2010. In 2012 the ECDC released a cautionary report on the Status & Importance Of Invasive Mosquito Breeds In Europe and in 2014 they announced a new joint ECDC-EFSA project called “VectorNet”. A network for sharing data on the geographic distribution of arthropod vectors capable of transmitting human and animal diseases. 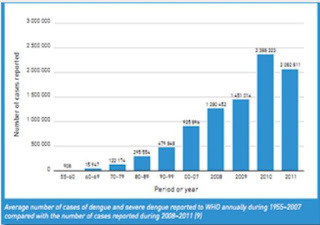 Also in 2010, we saw an unusually severe Dengue outbreak in Puerto Rico, that before it was quashed, had infected more than 21,000 people, killing 31 (see MMWR: Dengue Epidemic In Puerto Rico). Globally, Dengue has seen a 30-fold increase over the past 50 years (see chart below). 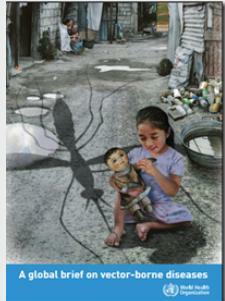 In early 2012, in Preparing For An Unwanted Arrival we looked at a 160 page preparedness plan, released by PAHO and the CDC, anticipating the arrival of Chikungunya to the Americas. The Pan American Health Organization/World Health Organization (PAHO/WHO), in collaboration with the U.S. Centers for Disease Control and Prevention (CDC), has published new guidelines on chikungunya, a mosquito-transmitted virus transmitted that causes fever and severe joint pain. The Guidelines for Preparedness and Response for Chikungunya Virus Introduction in the Americas aims to help countries throughout the Americas improve their ability to detect the virus and be prepared to monitor, prevent, and control the disease, should it appear. To download the guide, Preparedness and Response for Chikungunya Virus Introduction in the Americas select this link. Not quite two years later, the virus finally arrived in the Americas (see WHO: Chikungunya In Caribbean – French Part of St. Martins), and within a year was widespread in the Caribbean, South and Central America. In May of 2014 we looked at how Florida was Preparing For Chikungunya, and only two months later Florida reported the 1st Locally Acquired Chikungunya Infection In United States. While the number of cases remains small, the risk returns every year. In April of 2014, the WHO declared World Health Day 2014: Vector-Borne Diseases, with the theme Small Bite, Big Threat. And with Dengue continuing to expand in South America, and joined by Chikungunya, the CDC held a Grand Rounds: Preventing Aedes Mosquito-Borne Diseases in May of 2015. Mosquito borne diseases sicken and kill millions of people each year, and we've had decades of warning that they could someday return to the United States (or Europe), but the threat has remained largely ignored by the public. Regardless how Zika pans out, it isn't the only current threat (i.e. Dengue, CHKV, Malaria, etc. ), nor is it likely to be the last obscure mosquito-borne virus that will emerge from the jungles and threaten global health. Nature has a very deep bench. And with reports that Insecticide resistance is already widespread, we'll need to find new and better ways to control these mosquito vectors, if we are to stay ahead of these growing 21st century threats.